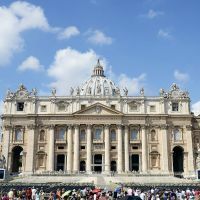 You will be spoilt for choice in Rome with a church adorning every corner all with their own story and interesting facts and holding some of the most beautiful frescoes, paintings and sculptures that the world has ever seen. The below is a selection including the most famous Sant Peters Basilica the centre of Christendom. There is a strict code of dress within the churches and please note that shoulders and knees must be covered when entering any of the cities churches and controls are especially thorough at the Vatican where you will be turned away should these requirements not be respected. Traditionally believed to have been erected over the spot where Stant. Peter was buried after his martyrdom in Rome around 64 CE there is no question that this church will leave you completely lost for words! The Basilica is of enormous dimensions (capable of accommodating 20000 persons ) and the frescoed ceilings are breathtaking. 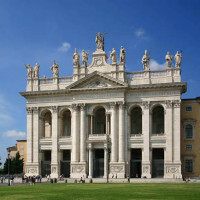 It contains some of the finest pieces of art including the statue of La Pietà di Michelangelo and Il Baldacchino di Bernini(the papal alter).Also the home of the Pope who can be seen at the papal audiences outside in the Piazza in front of the Basilica on Wednesday mornings ( weather and the pope's schedule permitting). The church also has a dome observatory which although not free is well worth the visit due to it's amazing views of the city and down onto the square below with the colonnades designed by Bernini. Another particular of the church is the Swiss guards which has become a symbol and an interesting photo opportunity ! All entrants to this army must be Swiss, catholic, and they must take the oath to the pope. This oath is always taken on the 26th May to commemorate the same day in 1527 when Swiss guards protected pope Clement VII during his escape to Castel Sant'Angelo when of 189 guards only 42 survived. 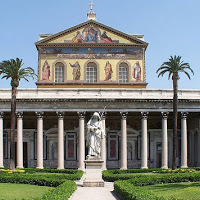 The Basilica di San Paolo fuori le Mura was founded by the emperor constantine of the former roman empire and according to the tradition is the burial place of Saint Paul the Apostle of Jesus. Although a little bit out of the city centre it can be easily reached by Metro and is well worth the visit. Along the nave you can see mosaics of all the popes from Peter to John Paul II. And the basilica also boasts a cloister built between 1208– 1235 by the Vassalletti Family. The inscription in the mosaics is a poem describing the importance of the cloisters in the life of a monk and the use of cloisters as a place of meditation and study. 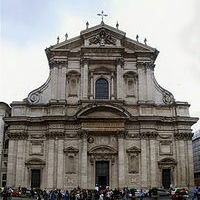 Although when one thinks of churches in Rome The vatican springs to mind but The Basilica San Giovanni is actually the oldest and the mother of all churches in Rome, ranking before the other basilicas. What was originally used as the palace of constantine was later re-modelled to serve as the church of the pope in Rome and today it serves as Romes official cathedral. The arch-basilica which was built on the site of the original church and is dedicated to St. John the Baptist. One of the smaller basilicas but one of the most beautiful Santa Maria in Trastevere stands cosily in the corner of one of Trasteveres main piazzas. 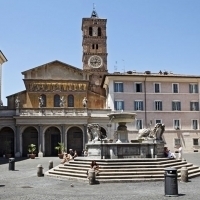 Trastevere is one of the oldest and most vibrant areas of the city showing the real roman life and offering a variety of some of the best pizzerias and trattorias that the city has to offer. 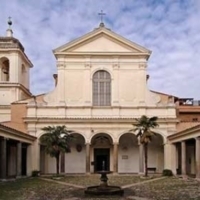 Santa Maria in Trastevere is the oldest church dedictaed to the Virgin and at this actual site 38 b.c a fountain of oil flowed for an entire day which was later interpreted by Christians as a sign of the birth of the Saviour. The church leaves a wondeful impression at first sight with an eye catching medieval mosaic that adorns the exterior and shows the Virgin and Child and a procession of 10 vergens approaching from both sides. One of the 4 patriarchal basilicas of Rome and centrally located nearby to the colosseum. Dedicated to the Blessed Virgin Mary the church was first founded by Pope Liberius and financed by patrician and his wife who were childless and decided to leave their fortune to the Blessed Virgin who appeared to them in a dream and told them to build a church in her honour. Should you stay here in August on August the 5th white rose petals are dropped from the dome during the mass to commemorate the the legend dating back to possibly 358 when a miraculous snowfall outlined the plan of the church. Santa Maria Maggiore also boasts the highest bell tower in Rome at 75 metres with a pyrimidal spire added in the 16th century. A rather unusual structure located in Piazza Republica the church rather seems to be a roman ruin from it's exterior and in actual fact was built within the remains of the Baths of Diocletian, and the church is also consequently dedicated to all of the christians who died whilst constructing these Baths. It is reported that a Sicillian priest witnessed angels in the ruins of teh Baths in 1541 after which it was ordered by Pope Pius IV that a church should be built there. The beginning of the work saw Michelangelo designing the church to be finished by Jacopo Lo Duca (Michelangelos student) after his death. 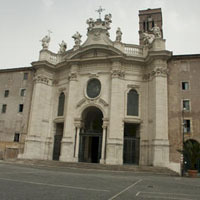 Today Santa Maria degli Angeli is often the host of prestigous weddings and funerals promoted by the state. Centrally located at the top of Via Nazionale this church is well worth the visit. 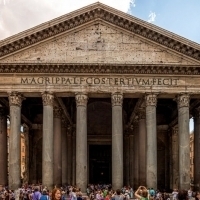 Absolutely breathtaking – this is a fine example of roman architecture at it's finest. Just a short metro ride away on the Line A you willdiscover why this church was used as an example for many churches all around the world. Supposedly founded by the Emperor Constantine in 320 using one large chamber of the Sessorian Palace to house the relics brought by his mother Helen from Jerusalem. For art lovers this is also an ideal place to feast your eyes upon the works of Pannini. A trip to Rome would not be complete without a stop at the Spanish Steps, that has now become a famous meeting place for Italians and foreigners alike. 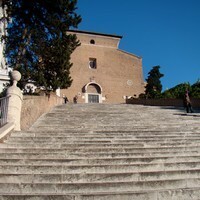 The impressive staircase leads up to the Trinità dei Monti – of which it's well diffused images are already known worldwide. 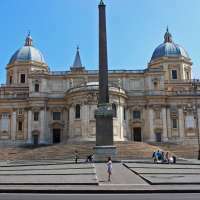 Directly in front of the church is the roman obelisk which dates back to Imperial age from the Garden of Sallustio but as can be appreciated today it was moved to the front of the Trinità dei Monti in prder to create a focal link between the church and the stairwell. This church should be seen in all it's splendour both during the day and illuminated by night. 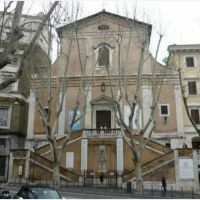 This rather unusual church is located just in front of our very own Bed and Breakfast in Rome Di Cappuccini on Via Veneto and is dedicated to the Blessed Virgin Mary, this church is also known as Our Lady the Immaculate and Church of the Capuchins. This church has become a particular tourist interest due to the fact it has furnished ossuary of the Capuchins completely in bones! From 1528 to 1870 friars serving the church were placed in a vault following their death and after some time the bones were retrieved to create this room of bones placed in a macabre style. The walls and furnishings are now adorned with over 4,000 bones of past friars. 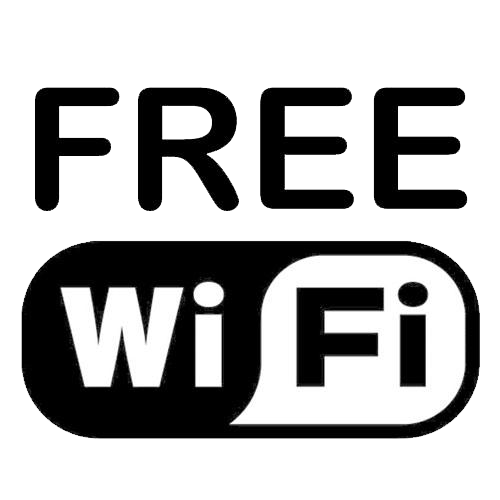 Very centrally located definately worth a visit if not only for the curiosity! Probably on first sight not considered a church this was actually a roman temple built in 27 bc and it's pure immensity will astound and that is just from looking at it from outside! The front has 16 enormous columns transposrted all the way from Egypt which is very difficult to imagine now let alone in ancient times! The Pantheon has a very special feature as the dome has a hole in it which is ideal on rainy days. 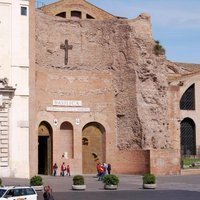 Located in the splendid Piazza dl Campidoglio rising above the roman forum you will find this church dating back to the 6th century. Stunning features include the wooden ceiling, the ancient columns and beams and magnificent chendeliers. Artistically speaking you can witness beautiful frescoes by Pinturicchio on the life of San Bernardino. If you can bear the walk up the rather steep 14th century staircase this church (built according to legend where the Emperor Augustus had a vision of the Madonna and Child) is certainly worth a visit. Located close to Rome’s official church headquarters (St. Johns Basilica) and the Colosseum, the church of San Clemente has what is considered to be the finest medieval interior housing gloriousmosaics from the 12th century. Below the actual ground level of the church you will find the ruins of a Mithraic Temple which can be visited and appreciated by the public. 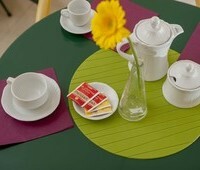 Transport: 5 minutes on foot from Piazza Venezia up Via del Corso on the left hand side. 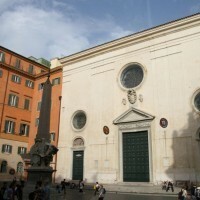 Leading off of one of Rome’s most principal streets (Via Del Corso) there is the small but very original square ‘Piazzetta di Sant’Ignazio’ which is home to the Church Sant’Ignazio dedicated to Gregory XV (thr founder of the society of Jesus). Main features include Andrea Pozzo’s decoration of the vault using the baroque dream of conquering infinite space with the techniques of optical illusion. On the way to the Pantheon this is certainly a church to stop and visit. Incredibly overwhelming in it’s rich interior, works of art can be marvelled by the likes of Bernini and Pozzo. This church is actually the principal church of the Jesuits. The design is by Vignola and Giacomo della Porta and it’s plan and facade dating back to 1575 has been imitated in many churches sparse around Europe. 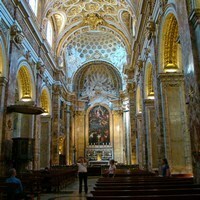 Here you will also find the resting place of the artist Andrea Pozzo. The undisputable size and beauty of St. Peters dome is the most dominant piece of architecture that can be admired from the Roman skyline, but there is a another rather apparent dome ruling the skyline and it is that of the church of Sant’Anrea della Valle boasting the second largest dome in the city, built between 1591 and 1665. 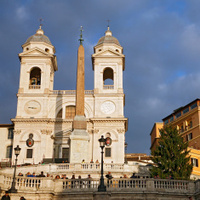 Transport: A stones throw away from Piazza Navona, 2 minutes on foot. Not to be missed is the stunning chapel decorated by Caravaggio between 1599 and 1602 this is tje official French church of Rome and it is worth a visit just to see the three Caravaggio works of art that all depict events from the life of St. Matthew. Location: Corso del Rinascimento, 40. 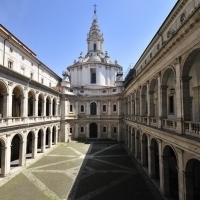 ‘La Sapienza’ in actual fact refers to the University of Rome which can be principally found today close by to Termini station. 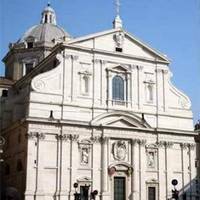 This church was indeed built for the former university back in 1650 by Francesco Borromini located in what is known as the ‘renaissance quarter’ close by to Piazza Navona, a landmarke strongly recommended for a visit during a stay here in Rome. Transport: Behind the Pantheon can be reached by the Bus Express 40 from Termini stopping at Largo Argentina. Just a stones throw away from the extremely famed Pantheon this church may not be an architectural delight but it’s interior certainly makes up for it’s lack in facade. 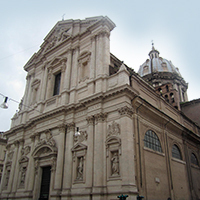 Som of Rome’s greatest treasures are displayed in this church including the Statue of the Risen Christby Michelangelo, and the burial monument of Leox and lement VII dating back to 1536-41. This church is located in a neat little square by the side of the luxurious Hotel Minerva and making it even more of a landmark is the well known sculpture in the middle of the piazza (a marble elephant designed by Bernini with an egyptian obelisk standing on it’s back dating back to the 6th century). 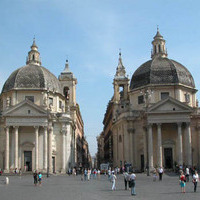 Piazza del Popolo is located at the very top of the Via del Corso and is a vastly spacious square with two churches almost identical side by side. A large part of the design was by Bramante and Bernini and it’s main treasures include 2 great masterpieces by Caravaggio, frescoes by Pinturicchio, the Chigi Dome by Raphael, Tombs designed by Andrea Sansovino, and stunning glass windows by Guillaume de Marcillat. Telling a lie could cost you your hand, or so legend would lead us to believe! 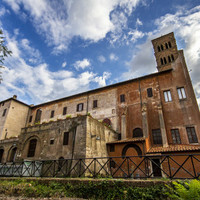 There is only one way to find out and that is to visit the church of Santa Maria in Cosmedin and risk putting your hand in the ‘Bocca della Verità’...the famous mouth of truth. This medieval building has not only become a landmark due to this fact but also thanks to the beautiful interior with stunning pavements, pulpits, choir screens and 8th century mosaics, although it is not in posession of any of the great masterpieces or treasures that you will find in many other churches.